Which is the superior gender? Are we gals better than guys or do they have the edge on us in some regards? These questions come to the fore every now and again in various guises. A grey / white brain matter example comes from Science Daily. SD also tell us that men and women handle stress differently, with different parts of the brain coming into play to handle the stress. Men are more likely to have physiological reaction, turning to drink. Women take a more psychological turn. The debate about intelligence differences between the genders is more complex. On the one hand, is it merely another variation on the brain differences? On the other hand, is there a nature /nurture debate? Is the fact that females are catching up on males in terms of state exam results on the nature or the nurture side? Will we ever know? Here’s a fun game to add to the debate – http://www.trivialpursuitexperiment.com/index.php. You tell the program whether you’re male or female. Your incorrect and correct answers to the trivial pursuit questions are then used to make up the overall total for males and females. At the moment, the obviously superior of the species are ahead! It’s not perfect. Online, no-one know you are a dog. If you lie and say you are the other gender the computer is not going to know. Nor do we get a break-down on the male / female scores for the categories. It’s good fun, a nice way to while away an hour on a rainy saturday afternoon. It doesn’t tell you the correct answer to questions you answer incorrectly though. If you don’t know what the first usage of genetic fingerprinting was, you’ll have to google (or Bing) the answer. The same applies for deciding which sport is called the “sweet science”, or the record time for solving the Rubix Cube. There is a counter so you can’t cheat and Google / Bing mid-question. A new survey from Bristol University tells us that left-handed pupils fare less well in tests than do their right-handed classmates. The tests in question, which may be beside the point, are the British national curriculum tests (SATS) and IQ tests. They surveyed over 10,000 children – enough to have some significance. On behalf of lefties the world over can I say hang on here a minute!! What about the “Lefties think faster” idea. Lefties have faster connections between the left and right hand hemispheres of the brain producing faster response times, and so can use both side of the brain more efficiently that righties. Makes logical sense. Yet, its a righties world. Ask any lefty if they can scissor Christmas wrapping paper in a straight line and without jagging the paper? Tin cans have to be opened backwards. We can have some wonderful (oh, alright, dangerous) fun with power tools. But dont get me started on the “let me write the invites, you look so awkward with the left hand”. Apparently, every one in 12 of us is left-handed. This includes some impressive figures down the ages – Leonardo da Vinci, Michelangelo, Ludwig van Beethoven, Bob Dylan, Paul McCartney, Benjamin Franklin, Isaac Newton, Albert Einstein, Charlie Chaplin, John McEnroe, Martina Natratilova. They seem to have done alright, no slow thinkers there. Society has become more accepting of us. Time was when to be left-handed was a condtion to be fearer and a habit to be broken. Go back a generation and primary school teachers had the job of forcing lefties to write with their right hand. 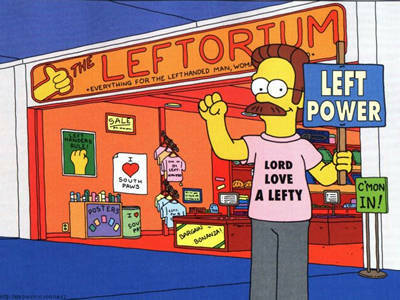 Now, lefties are allowed the full expression of their leftiness. But its not all roses. The vast majority of dyslexics are left-handed (I know I have seen stats on that somewhere reputable). Left-handed females are paid significantly less than right handed females, but left handed males are up there on a par with their righty brothers. Given that females are paid less than males to start with, that’s not good at all. Us lefties, particularly lefty females, need to club together and defeat this inequality. C’mon now Sisters! !